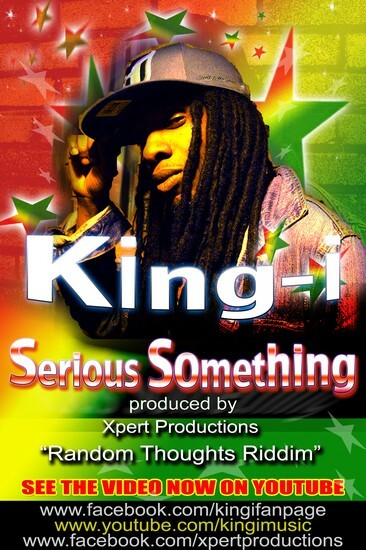 #SeriousSomething on the Random Thoughts Riddim is King-I's latest single previously released on 9/21/12. The 'Random Thoughts' Riddim is produced by brothers Jason and John James of Xpert Productionsbased in Carriacou (Grenada). The Official Music Video for 'Serious Something' was directed and edited by King-I. Previous official video releases include Play of Sensi, Superstar, and World is Turning as featured on various video outlets including Youtube.com/KingiMusic,United Reggae, Zona Reggae, Rasta Respect, Mister. Bigga and otherinternational video outlets. King-I is one of today’s most promising emerging artists. His dynamic and versatile style as a updated cultural reggae artist reflects his early roots in Trinidad & Tobago as well as his influences of popular music that he listened to while growing up in an urban US neighborhood. Through his positive music he wisely and spiritually spreads his love for the people. Described as a powerful and soulful performer, King-I’s “powers” are seen in his engaging and highly energetic stage performance.